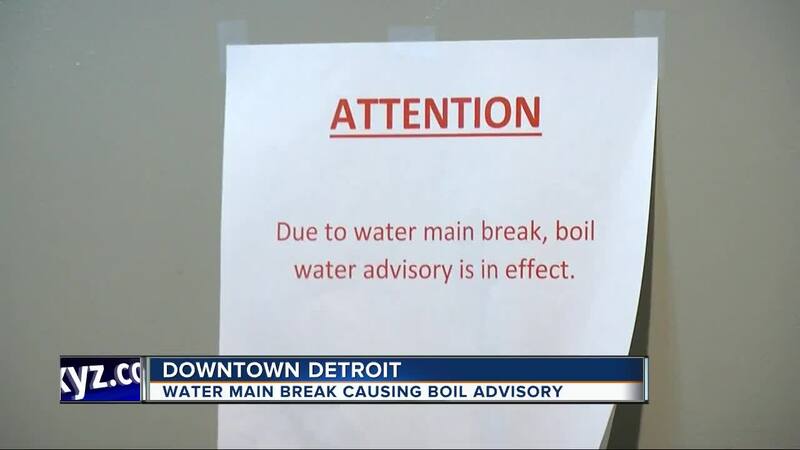 DETROIT (WXYZ) — A boil water alert that has been in effect for parts of downtown Detroit has been lifted, according to the Detroit Water and Sewerage Department. The alert went into effect on Sunday after a water main break. The boundaries for the water main break are defined by the the Lodge Service Drive to the west, Mt. Elliot to the east, I-75 to the north and the Detroit River to the south. It was expected the break would last until Thursday, but the department said the alert would be lifted two days early. According to the city, they had two rounds of testing from multiple sources including Cobo Center and fire stations. those tests showed no bacterial contamination in the city's water supply. It affected parts of the Detroit Auto Show at Cobo Center. As a precaution, and to comply with the advisory, all water fountains at Cobo Center have been shut off. According to a post on the Cobo Center Facebook page, bottled water is available to all visitors on the concourse level of the building at the Cork & Grind and Go Natural restaurants.